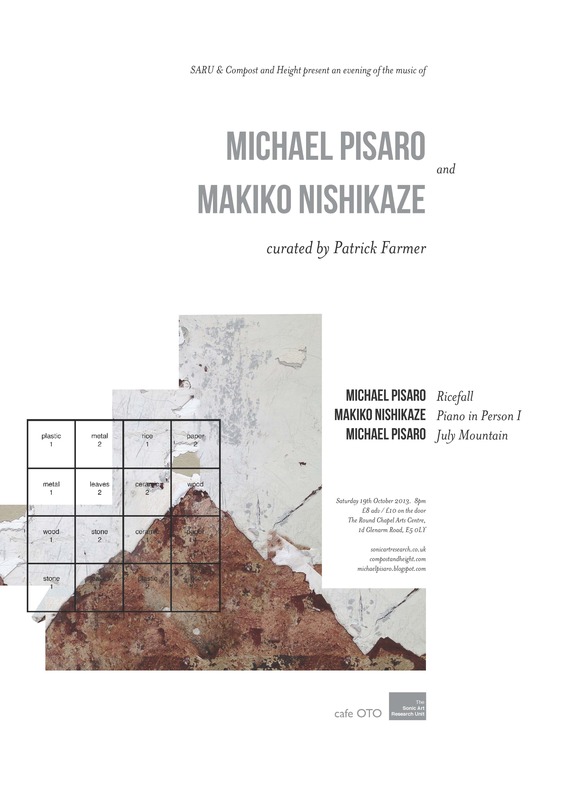 MICHAEL PISARO + MAKIKO NISHIKAZE CONCERT 19 OCT LONDON | who's that knocking...? American composer Michael Pisaro’s July Mountain, last performed by the same group at the Significant Landscapes Festival in Oxford, is a translation of the Wallace Stevens poem, July Mountain, into sound. It is a dense combination of strictly timed, crossfaded field recordings, sourced on this occasion from areas around the UK, and a slew of percussion sounds, such as bowed snare drums and the bowing of a prepared vibraphone. Ricefall, another piece by Pisaro, like July Mountain, was originally written for the percussionist Greg Stuart and realised in the studio with a great many overdubs. Its performance at the RoundChapel Auditorium will consist of 16 performers positioned around the venue, each adhering to a series of timings, whilst letting fall constant streams of rice onto a series of different objects. Composer Tim Parkinson will also be performing the UK premiere of, Piano in Person I (2006), by Makiko Nishikaze. Participating in this event will be: Daniel Bennett, Seth Cooke, Stephen Cornford, Dimitra Lazaridou-Chatzigoga, Angharad Davies, Jane Dickson, Patrick Farmer, Lawrence Dunn, Bruno Guastalla, Jack Harris, Sarah Hughes, Kostis Kilymis, Dominic Lash, Will Montgomery, Tim Parkinson, Samuel Rodgers, David Stent, Greg Stuart, and Paul Whitty. This entry was posted in diary, events, field recording, improvisation, music. Bookmark the permalink.